Joe Abercrombie writes grim dark fantasy novels, and he is on my list of favorite authors. His most famous work is The First Law trilogy. So if you have not read The First Law trilogy, then I envy you, because you have yet to experience for the first time, one of the best works in the genre. But I am not reviewing The First Law trilogy here. 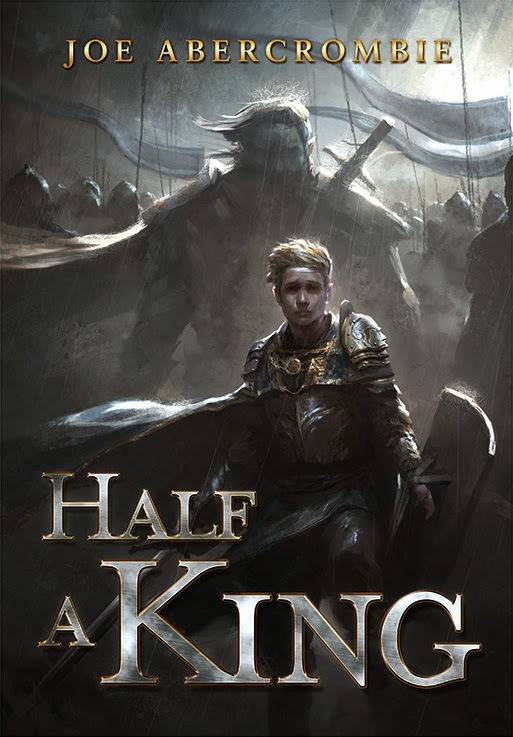 Instead, I would like to talk about Joe Abercrombie's new book, it has an interesting name called Half A King. In Half A King, Joe Abercrombie stepped into the genre of YA fantasy. To be honest, when I heard Joe Abercrombie wrote Half A King as a YA novel, I was really skeptical about this book, and it did not interest me. This is because I do not have a good impression about YA fictions. Let me explain: From my understanding, YA fictions often involve stories about “coming of age”, and the current YA market is dominated by books chokefull of cliches and repetitive themes. For examples, themes like; teenage romance, set in a futuristic, dystopian world, or some story about “the chosen one”, so on and so forth. I just don't like this type of books, they all feel the same to me and I find them boring. However, good reviews for Half A King began to spawn on the internet. Many reviewers described Half A King as ripping yarn set in a fantasy world resembling the Viking age. That grabbed my attention! Because I like reading Viking novels! So I decided to venture into the world of Half A King. The result? I love this book, and I am adding Half A King to my list of favorite books. Today, I would like to share some of my thoughts about this book, and the reasons why I like it. Let me start by providing a synopsis for this book. Day after day, bitter waves from Shattered Sea batter endlessly at the sandy shores. The harsh environment gave birth to a hardy people, their world governed by the iron arms of powerful kings. Kings who inspired awe and obedience by martial might. Our story began, when Prince Yarvi was born as the second son to the king. His birth served as a mockery to the royal family, because Yarvi was born with only one good hand. He could not grasp an axe or hold a shield to foray into the heat of a battle. In the eyes of his father, Yarvi was a weakling and a disappointment. Half a man, they called Yarvi. But that's fine because Yarvi was going to give up his status of princedom and become a minister. A twist of fate changed Yarvi's plan, when his father and older brother died in a murderous plot, putting Yarvi next in the line to be the new king. But Yarvi's deformed hand made him some sort of a joke, he was half a king, because he could never inspire the traditional image of a warrior king among his subjects. Half a king or not, Yarvi made a full oath to avenge his father and brother on the day he seated on the throne. As Yarvi sat on a lonely throne, he learned an important lesson; that things are never what they appear to be. Most YA fantasy novels suffer from cliched themes such as: “the chosen one”, “teenage romance”, or “good versus evil”. I am happy to report Half A King steered away from these cliches. Instead, it gave us a revenge story about a boy, and how his plan to exact vengeance on the murders of his family transformed him. In retrospect, Half A King breaks away from the stereotypical themes in the modern YA fictions, and this book refreshes the genre with a story bursting with realism and intrigues. Half A King also surprised its readers with unexpected twists and turns of the story. Unlike many fantasy novels where you can usually predict how the story will unfold, Half A King is unpredictable. When I was reading this book, there were numerous occasions when I predicted the story was going to unfold in a certain direction, only to discover in the next chapter, that the outcomes turned 180 degrees away from my prediction. I could feel a real sense of danger lurking behind the waves of the unfolding events in the story. This made the story both interesting and intriguing, where the unpredictability taut the story with tensions, while you guess, nail-bitingly, at the fate of your favorite character in the next chapter. Half A King also features one of the steepest character developments I've seen in the genre of fantasy fictions. Yarvi began his story as a weakling. As the story progressed, we could really see how Yarvi's traumatic experiences transformed him from a weak boy to a deeply cunning man. Meanwhile, Half A King has a cast of interesting, supporting characters. Their relationship with Yarvi was lively portrayed, cutting deep impressions into readers' minds. When I was reading this book, I felt the story really made me care about every character, and I was drawn into Yarvi's world. World building plays a crucial role in a fantasy novel, it can either make or break a story. 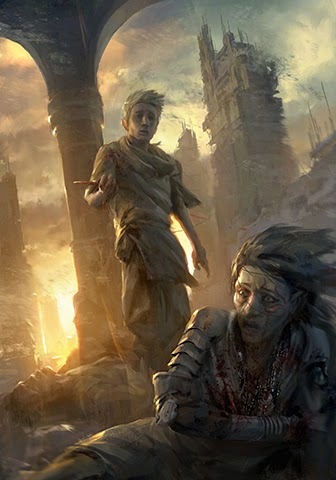 Joe Abercrombie is one of the masters in this art, and his world building skills shined in Half A King. In a mere space of 300 pages, Joe Abercrombie created a fully living, breathing world, complete with its own background history, culture and lore. The fictional world of Half A King is a reminiscence of the Viking world. 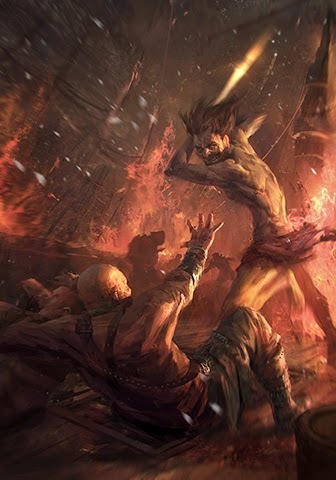 Joe Abercrombie brought this fictional world to life, with vivid portrayals of a harsh, cruel environment where the bitter cold assaults the land, and the merciless sea bears both despair and hope where people's livelihood reside. For me, reading Half A King was a joy ride. The story flowed at a very good pace. This is a fast-paced book, but it is also packed with enough details to draw a reader into its world. Joe Abercrombie's writings is top notch, it is energetic, vibrant, and descriptive. He used words strikingly and beautifully to craft captivating sentences, enabling the readers to visualize every scene in the book. As I closed the final chapter in Half A King, I marked this book on my "worthy to be re-read" list. This is a powerful and memorable story, and it is very enjoyable. It is true that Half A King is not The First Law trilogy, because it is not as bleak. But in comparison to The First Law trilogy, I actually prefer this diminished sense of bleakness in Half A King. In my opinion, Joe Abercrombie proved himself to be a versatile author, masterfully weaving the “grim dark” aspects into the story without leaving the readers feeling bleak at the end. Instead, readers emerged from Yarvi's dark journey at the end of the book, with a sense of satisfaction, eagerly anticipating the sequel, currently scheduled for release in February 2015, titled “Half A World”. P.S. I based this book review on my copy of the limited edition for Half A King, published by Subterranean Press. This is why the book cover, and the artworks displayed in my book review differ from the retail, paperback version of the book, which can be found at most bookstores.